Streets in Edinburgh's Old Town will close to traffic for one day a month as part of a trial aimed at "transforming" the city centre. A loop including the Royal Mile, Holyrood Road and the Grassmarket will be pedestrianised on the first Sunday of every month for 18 months. The trial, which will start in May, follows a public consultation into how people move around the capital. The city council said people wanted a "more radical" approach to transport. No firm proposals for the city centre's transport network will be tabled until May. But the council has produced images of a pedestrianised Royal Mile and Cowgate and a plaza across Lothian Road with reduced traffic. More than 5,000 people took part in the council consultation, with 51% saying they wanted a more radical approach to city centre transformation. A total of 37% called for "targeted investment" while 12% were happy with a business-as-usual attitude. About 37% of people surveyed were satisfied with the quality of Edinburgh's central public spaces. 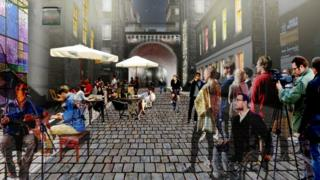 Project director Daisy Narayanan said the area outside the Usher Hall should be a "beautiful civic space". She added: "In most European cities, it would be a plaza, but it's cut through with six lanes in places, with an urban motorway. "One of the things that we don't want to do is just pick streets and pedestrianise it. It has to work within the framework of how the city moves." Transport and environment convener, Councillor Lesley Macinnes, said: "Our vision for the city's future is ambitious and it's clear from the recent consultation that the people of Edinburgh share that ambition. "There is not only a demand for change, but recognition that this needs to be significant in order to achieve an inspiring, healthier and more inviting city in which to live, work and play."